Friday July 8th 1898 Will went to town this forenoon. I did some baking and got the dinner. I slept in the afternoon and sewed carpet. It rained at noon so the boys could not work at the hay in the afternoon. Saturday July 9th 1898 We were busy with the work all forenoon. I put down the carpet in the kitchen. In the afternoon I slept awhile and practiced some. After supper we went to town in the Surry and took Pink up to stay with Mother thins next week. Sunday July 10th 1898 I was busy with the work the most of the forenoon and slept a great part of the afternoon. I was down to Johns a little while and got supper and Will and I did the evening work and went to bed early. 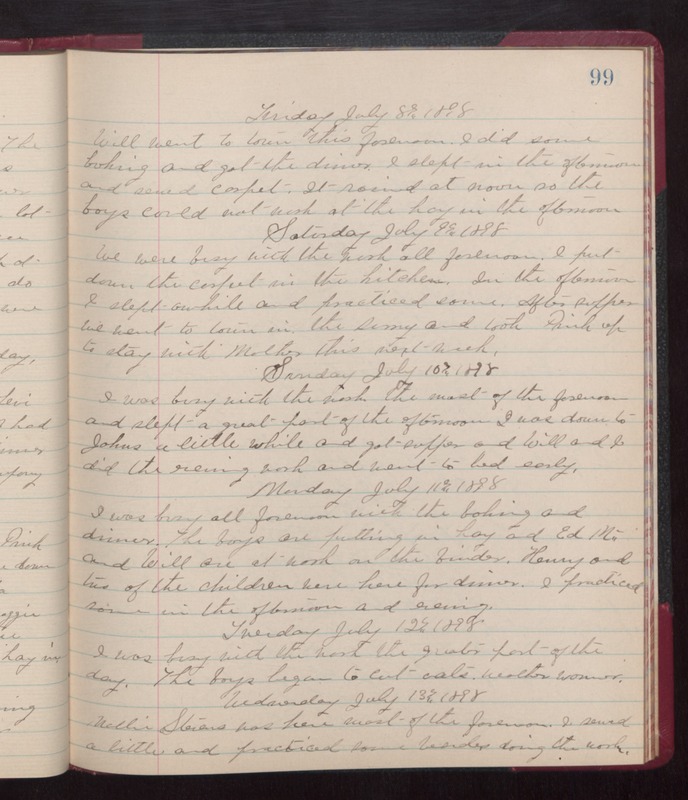 Monday July 11th 1898 I was busy all forenoon with the baking and dinner. The boys are putting in hay and Ed Mc-- and Will are at work on the binder. Henry and two of the children were here for dinner. I practiced some in the afternoon and evening. Tuesday July 12th 1898 I was busy with the work the greater part of the day. The boys began to cut oats. weather warmer. Wednesday July 13th 1898 Nellie Stevens was here most of the forenoon. I sewed a little and practiced some besides doing the work.